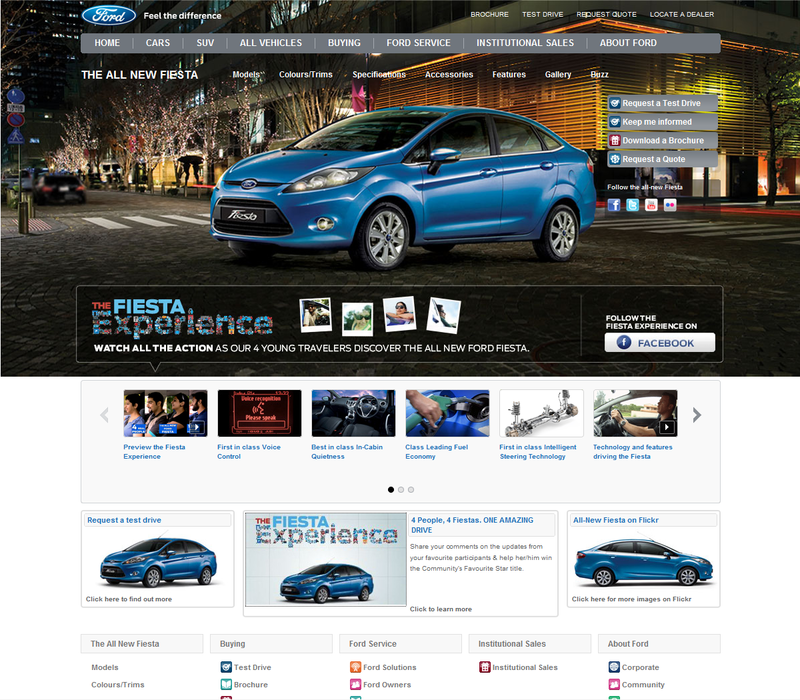 I first read about the new Ford Fiesta campaign on CampaignIndia and then the huge print ad sent me checking their website india.ford.com. The Campaign Idea itself (around the Ford Fiesta Experience) is quite compelling and does set some high expectations. The campaign picks 4 people who travel 1310 kms from Delhi to Diu, on a Ford Fiesta and talk about their 'Ford experience'. In my opinion, the quality of the video content could have been better - but this is a start and there is no denying that. Maybe hiring some editors would have helped set themes and regulate the content to keep it interesting, informative and engaging for the user and also bring in the car feature highlights subtly. The Ford Website is neat and once you get to the new Fiesta page you get to see the videos where the individuals are shown gushing about the new Fiesta. It is coupled with the Auto site staples of car pictures, models, colours, specifications etc. The Facebook page has some interesting discussions and user photos apart from profiling the new Ford Experience Videos. I really like the way it has been executed, the videos & images are upfron t and there are conversations on the same page with the Ford Community's Favorite Star promo details. What I love is Ford is attempting something new and different and also leveraging the power of digital - They have full fledged Twitter and Facebook pages, a Ford APAC & Africa Youtube Channel and Flickr Channel as well! The Flickr Channel though is an international effort called 'The Fiesta Movement'. These are all well managed channels with quality and frequently updated content. I do hope they have more videos to come that chronicle the drive and showcase the car than just single-mindedly doing the latter. Check out the Ford Facebook Page and the Website.